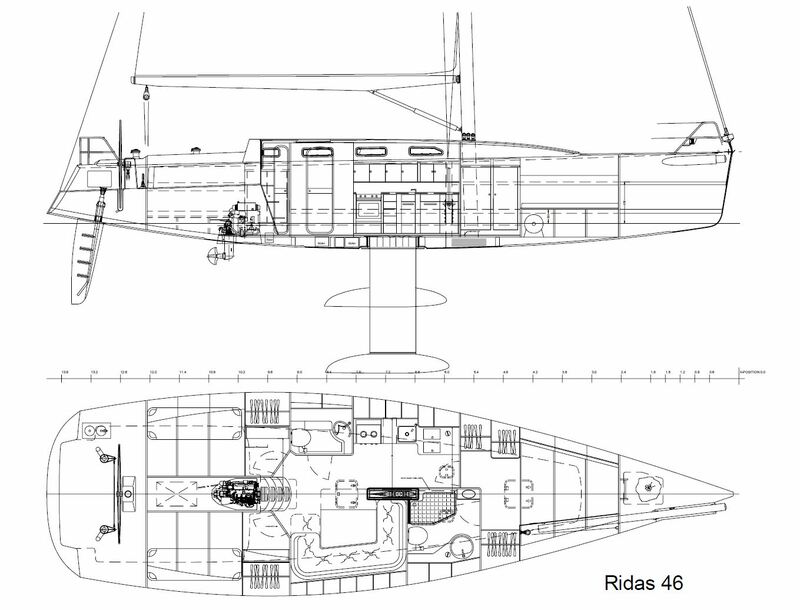 The Ridas 46 has at its heart principles of design which are formed from our view of the needs of the modern cruising/racer sailor. 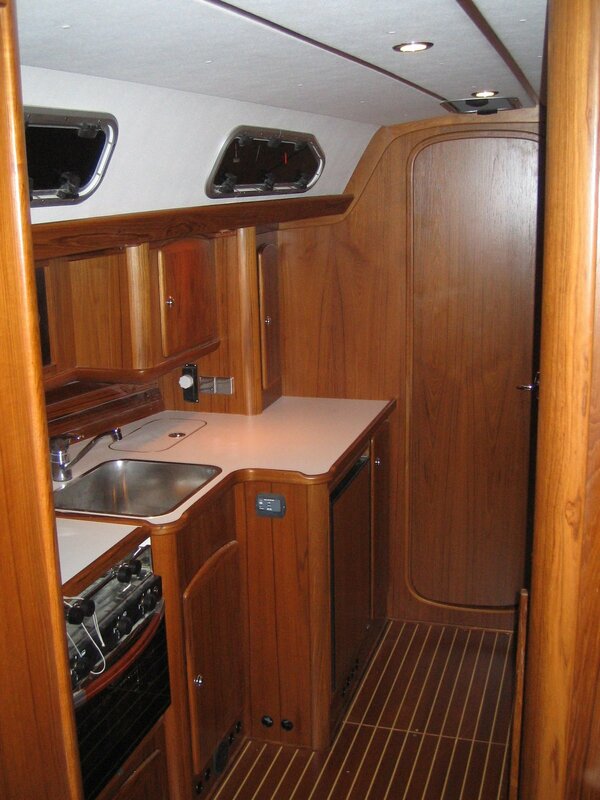 The Yacht has to be manageable with a skipper and one. It has to be of dimensions, particularly of beam and draft that allows access to places that we want to go to and the yacht has to get there without stress, quickly. 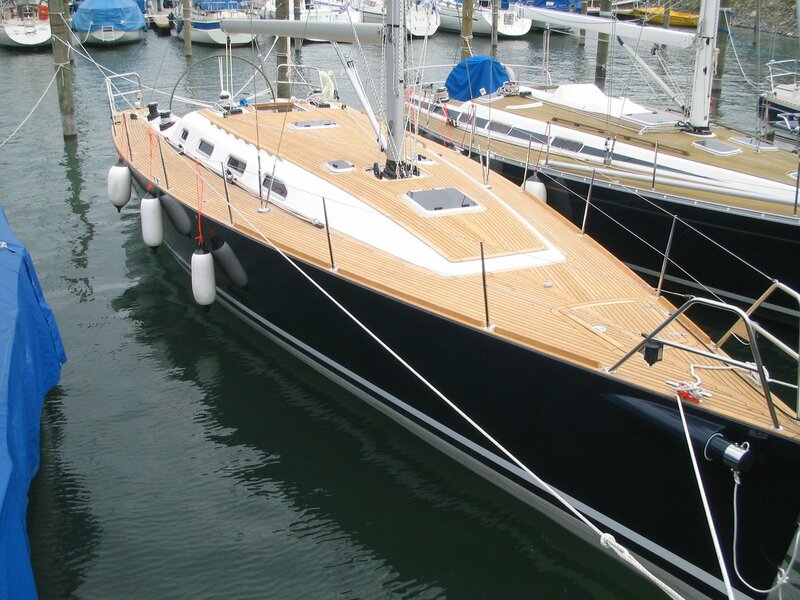 At Ridas 46 our goal is to create the finest, fastest, safest, yachts for discerning customers. 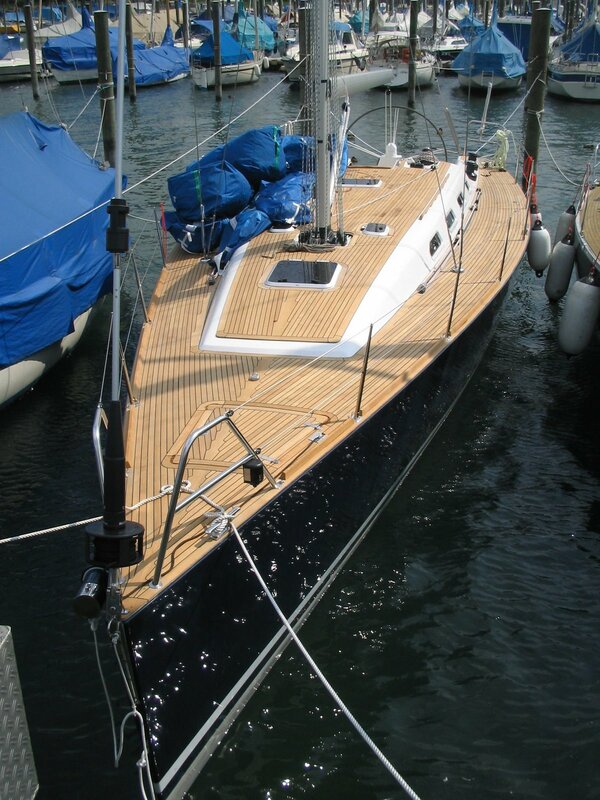 In order to achieve this we have chosen and designed a light to medium displacement yacht. For this reason we have selected modern high technology solutions for our composites. The choice of light to medium displacement when taken at the design stage allows for weight savings not simply in the hull but also impacts the critical decisions of keel design , rig size and sail design. A saving of 100kg in hull and deck at the design stage will also net a further 100 - 150kg from the keel, rig and sail plans. This combined with computer aided design of the keel and rudder foils provides for a stiff, light and therefore easily managed . One of the key priorities at Ridas 46 is residual value. For this reason we combine weight management, to provide performance, with premium quality construction materials and techniques to provide reliability and long term confidence. The Ridas 46 is built from a complex matrix of materials harnessing the benefits of unidirectional E glass fibres with the most excellent elongation, and water resistant characteristics of Vinylester resins. Due to stress cycling and water penetration it is estimated that a hull constructed wholly from Epoxy resins will be at 98% of its year 1 strength after 10 years, a hull built of Vinylester resins will be at 96%, a hull built from Isopthalic Polyester will be at 94% whilst the use of traditional Ortho - Polyester might provide values as low as 50%. The marginal differences described above for the three premium options are however influenced in many other important ways. The quality of workmanship, temperature and humidity control play vital roles. For this reason we choose to use the more expensive, more manageable Vinylester Resins which we post cure at 70 degrees Centigrade for 3 days. Stories of submerged containers and Whales continue to haunt the press! In the past woven roving combined with a sandwich of balsa provided a succesful solution for cored construction. This construction method whilst of significantly higher quality than an E glass chopped strand matt and woven rovings built yacht' has some disadvantages. Woven roving by definition has the capacity to stretch like all woven materials and in the case of a woven roving based construction these stresses are taken up by the resins hence the criticallity of elongation measures. We have chosen to use unidirectional E Glass stitched together rather than woven to remove stretch and Vinylester resins as discussed above. The result of this decision is to provide for an extremely stiff and strong laminate which when combined with a core of high density divinicell foam and a second laminate constructed with similar materials makes for an exceptional hull of extraordinary quality. The use of cross cut Balsa in the hull as a core remains prevalent in some yards. Balsa has the advantage that it acts with capillary action to draw resins through it, facilitating the bonding of a sandwich and creating a degree of impermeability. We choose to use Divinicell foam which allows us to determine through the use of vacuum both impermeability and quality of adherence. This technique also allows us to check the individual bonding of each small cell before the second laminate proceeds. Hull and deck are vacuum infused which gives us the best resin glass ratio and 100% warranty that Dinivycell is well attached to both laminates. No risk of delamination. Sailing has to be fun, risk free and when push comes to shove the kit has to work. At Ridas 46 we specify to load forecasts not to price, we specify for functionality, longevity and durability. For this reason we have chosen Harken as our key suppliers with whom we have developed strategic alliances allowing the flow of both innovation and value. 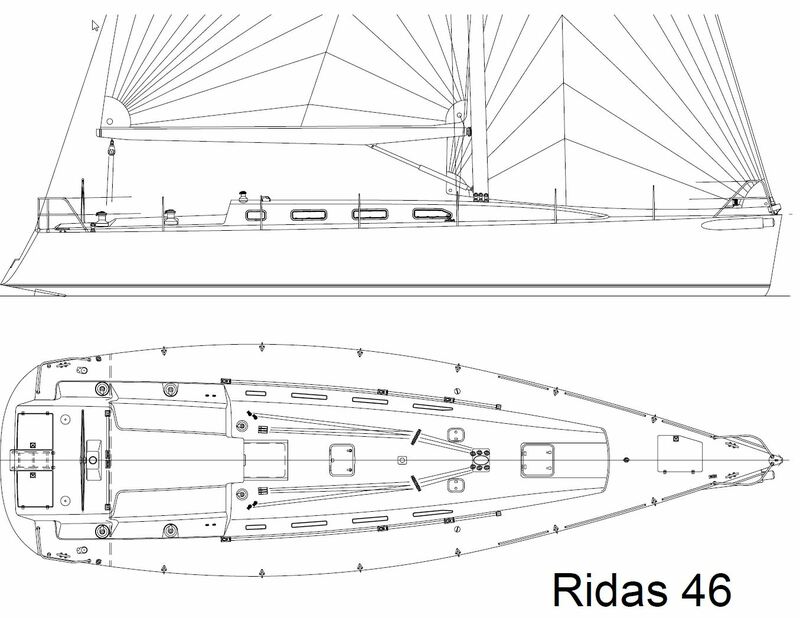 Ridas 46 specifies a three spreader rig which for a yacht of this size is relatively unusual. We have chosen this type of rig for reasons of wind resistance and elegance. 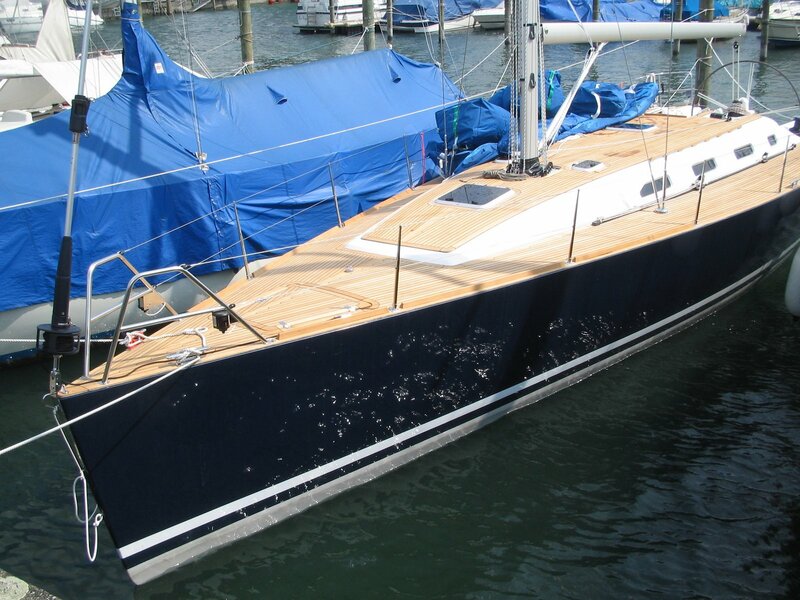 We have also chosen this rig because the rig allows the mast to be bent more, permitting improved sail trim opportunities and allows for a closer sheeting angle for the Genoa. These decisions enabling improved trim and sheeting angles are of course extremely important to the yachtsman choosing to compete offshore, but perhaps more critically the capacity to flatten the main becomes very interesting in stronger winds for the cruising sailor who seeks to control heel, point for home and get there quickly. 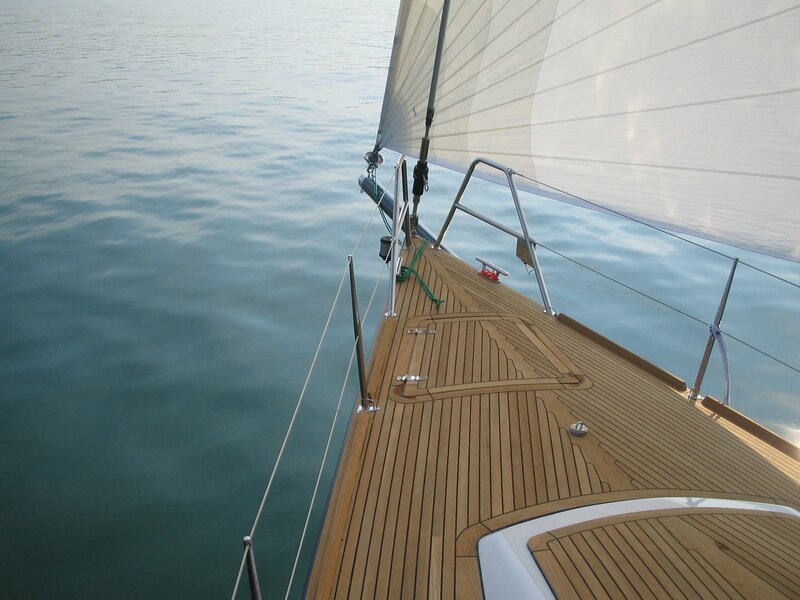 The design of both the keel and spade rudder adds to the performance and joy of the Ridas 46 The deep spade rudder and waisted keel have both been modelled, optimised and subsequently constructed using CNC technology allowing an accurate and strong reproduction of these foils. The rudder stock is machined from aluminium with Jeffa self adjusting bearings and this combined with close linked, low friction steering, provides for finger tip feel on the helm. 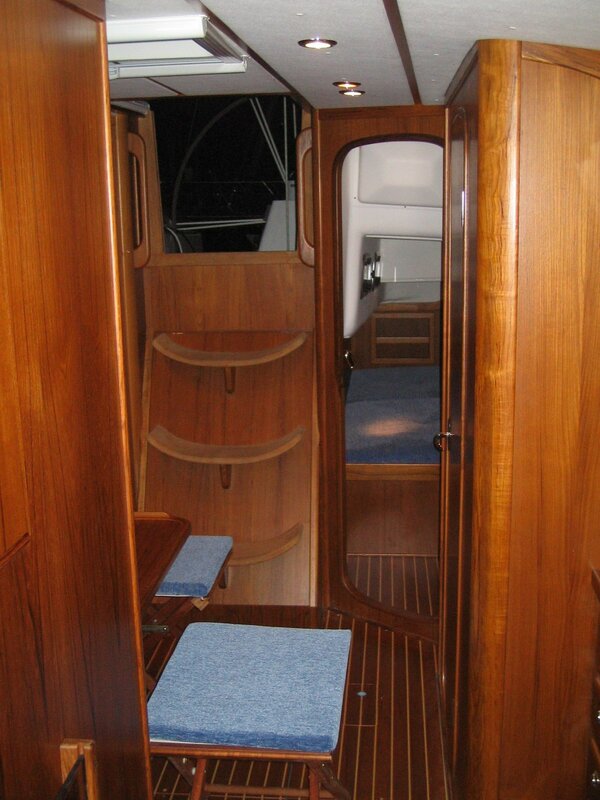 All joinery and Teak work is completed by hand by Ridas Yacht. 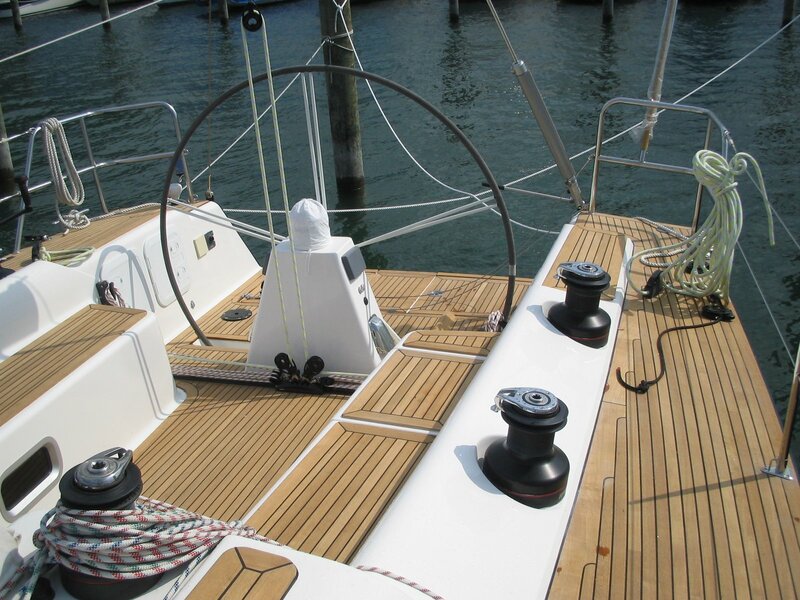 Close attention is paid to matched veneers and the quality of the Joinery on deck or below is of the highest order. As these yachts are built to order by hand we encourage the participation and involvement of new owners in the specifying of detail. The yacht is specified white. Any colour maybe chosen at additional cost. It is our view that colours other than white should be applied after the hull has been hot cured and we would recommend Awlgrip. We believe that the helmsman should be able to control his or her sails and the power they provide. For this reason the Genoa and Mainsail control lines are led aft to the helmsman and the winches set close to the wheel.